We're proud to offer our shabby chic barn venue perfect for weddings and events. With majestic vaulted ceilings adorned with elegant trim work and chandeliers, you'll soon see why so many couples choose The Silver Spoon Barn for their wedding venue. Our barn venue is a breathtaking place to behold. Nestled on almost 50 acres overlooking the expansive horizon sits our exciting new venue. Complete with elegant vaulted ceilings that showcase beautiful crystal chandeliers, this scenic view is where so many couples say, "I do." Just above, you'll find an enchanting loft area perfect for seating additional guests or snapping that perfect photo. Every facet of our venue exudes beauty and elegance, and with our team to assist you through the day, rest assured we'll help you create a moment to remember. There is no better place to share your wedding day than with The Silver Spoon Barn. Our venue offers a rich variety of amenities along with unpaired beauty both indoors and outdoors. Brides and grooms are free to personalize the venue with elegant drapery, floral centerpieces, linens and more. Whatever your vision may be, you can accomplish that with us. No matter the occasion, we're ready to host your next event! We offer our lovely venue for baby showers, family reunions, holiday parties and even proms! 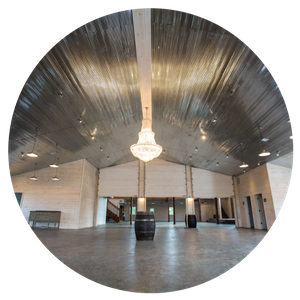 With plenty of space for seating and dancing, we're confident you will be happy you chose The Silver Spoon Barn. Part of what makes our venue so unique, beyond its size and beauty, is the rich variety of amenities. 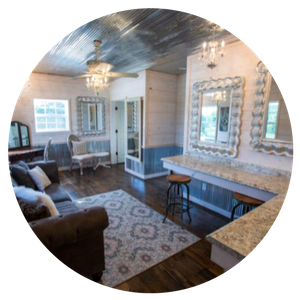 We provide all the comforts and conveniences you need for your wedding or event, including a bridal dressing room and groom's dressing room. Not to mention, we have plenty of space for any event. With more than 8,500 sq ft, our venue can accommodate up to 500 guests. Enjoy our spacious bridal room for the big day! With luxurious marble counter tops and plenty of mirrors and lighting, you won't have any problem perfecting your wedding day look. We haven't forgotten about the guys! 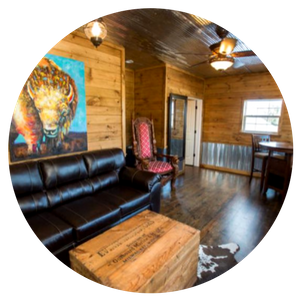 For the groom and his groomsman, we offer a dressing room complete with a comfortable sofa, tables and chairs, and a TV. We feature a large additional room perfect for intimate party gatherings, extra seating or even a great platform for dancing and so much more.